This casino is not approved by our expert reviewers, but there are plenty more to choose from. From time to time I like to search the Internet for online casinos that offer something unique in addition to safely and security. Last night when I was doing my usual search I came across Buzzluck Casino. I have to say the name of the casino sounds a bit funny. Nevertheless, I decided to give it a try, mainly because I read that the casino accepts US players like me. From what I saw Buzzluck Casino is an online casino established in 2011 and powered by NuWorks software. It is run by World Online Gaming N.V. and it is licensed and registered under the jurisdiction of Curaçao. I read about its safety and that it stands for responsible gambling which is good. My first impressions were positive, so I decided to register a new account and learn more about the software and games. As a big fan of blackjack I like to play the game at land based casinos as well as online and on the go. I also like it when there are many blackjack variants to choose from. Unfortunately, Buzzluck Casino offers only one blackjack game powered by NuWorks software. I could play the game for both free and real money and it had nice graphics and sound. The game play runs smoothly and it loaded fast. However, I much prefer to have a choice of blackjack games rather than having no variation at all. In Blackjack from NuWorks software the dealer must hit on 17. Players can double any two cards and only one card will be dealt to split Aces. The betting size ranges from $1 to $100. Blackjack pays 3:2, while insurance bets pay 2:1. Even though the blackjack choice at Buzzluck Casino is limited, in general the game library is pretty wide. I could see slots subcategorized into 3 reel, 5 reel, bonus round and progressive jackpot slots and some titles were Big Rig, Carnival Cash, Eye of Egypt, Greek Goddess, Monsters Millions The Champ and so on. I’m not that familiar with NuWorks software and its games so with the practice mode at Buzzluck Casino I could learn more about the games, their graphics and overall quality, which, I must say, they are impressive. The table game selection, besides blackjack, was comprised of games like Baccarat, Texas Hold’em Bonus Poker and Tri Card Poker, while the video poker library was made up of various video poker variants starting from one hand and going up to 100 hands per session. Some titles were Jacks or Better, Deuces Wild, Joker Poker etc. Keno and Bingo were also available. There’s no blackjack bonus as such, but as a new player at Buzzluck Casino I was offered a nice match bonus designed to double my initial deposited money. It was a 100% welcome bonus up to $878 on my first deposit. The bonus code is Buzzluck. I checked the terms and conditions page to find out more about the bonus and I was happy to see that I can use the bonus money to play blackjack which contributes 10% toward meeting the playthrough requirement of 25 times the bonus plus deposit amount. In the download casino client there was also a nice 55% unlimited all games deposit match bonus. 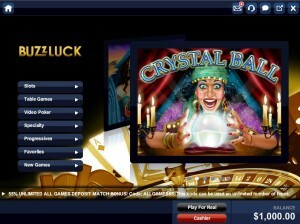 Besides the welcome bonus offer, I also saw that Buzzluck Casino offers excellent daily bonuses and promotions. On Mondays, for instance, if I deposit up to $100 I can claim match bonus of either 67% or 77%. Slot fans will be happy to know that if they decide to deposit on Tuesdays they will get 72% mach bonus to play slots. Risk-free Wednesday offers users 30% cashback on net losses for the day, which only needs to be rolled over twice before you can withdraw it, so that’s a pretty good offer. On weekends there is a special 70% bonus on any game. If you use the bonus 5 times you will get additional $20 free ships, while if you use it 10 times, you will receive $50 free chips. On the top right hand corner on the homepage of Buzzluck Casino there is short info saying that instant play is coming soon. 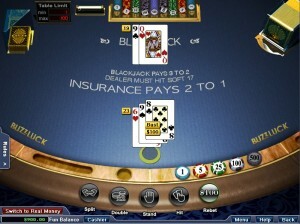 Therefore, as of this writing, US blackjack players that own Mac computers cannot access the games because they are compatible with Windows computers only via the download casino client. Unfortunately, the casino also doesn’t have mobile casino app so I cannot play blackjack on the go via my iPhone or my Android tablet. All of the deposit methods can be used for withdrawals, and you also get the addition of Wire Transfer and Courier Cheque. The minimum withdrawal amounts range from $20-$350, while the maximum is $5001 for all bar Cheque, which is $2500. In general, there are no fees for deposits, while some cashout methods have specific fees. Despite the fact that there is still no instant play casino, mobile app and more blackjack games on offer, Buzzluck Casino is a great online casino that offers some unique games that cannot be played at each and every casino. It also has unique bonus program and excellent daily bonus offers. The casino caters to a US casino fan like me and offers suitable and reliable banking options I can use to make transactions. The casino is also safe and secure and offers 24/7 support available via phone number, live chat and e-mail, although on some occasions, it can be tough to get hold of an agent through live chat.